Buffet lunch and roundtrip transfers are included! Everything was good and excellent attention from the tour guide! Travel to the famous Doi Suthep Temple in Chiang Mai, one of Thailand's most popular attractions, and visit the city's other well known temples. After a convenient morning hotel pick up or meet up, you kick off your adventure with a visit to Wat Phra Tat Doi Suthep, one of the country’s most sacred temples, surrounded by breathtaking mountain tops and steeped in legends. 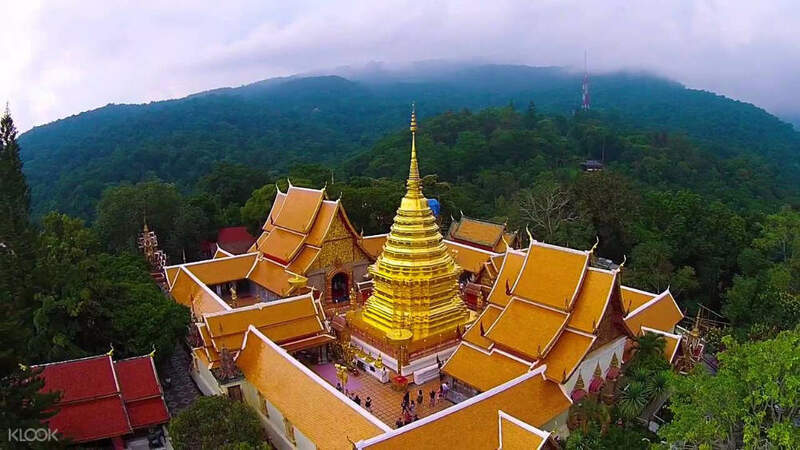 You won't be able to miss the golden spire that glitters near the summit of the Doi Suthep mountain! 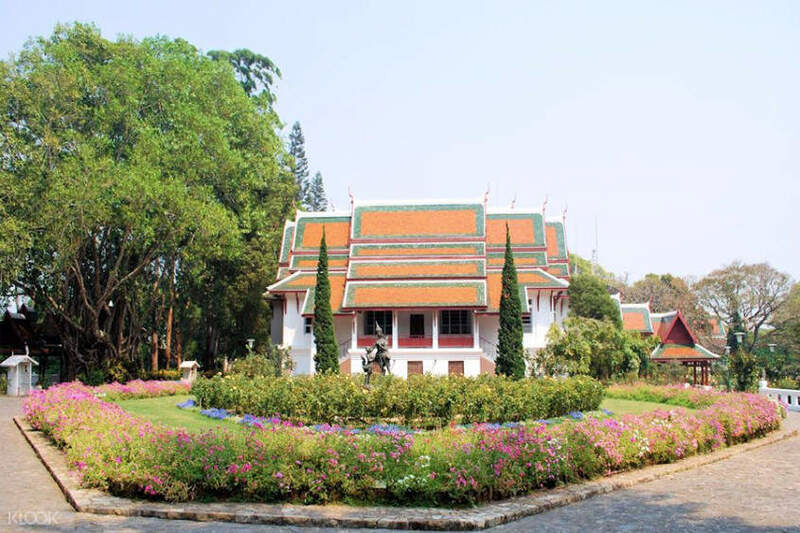 Your next stop is Bhubing Palace, the winter residence of the Thai Royal Family, where you'll find an abundance of flowers and several different indigenous trees which are unusual to see in most parts of Thailand. 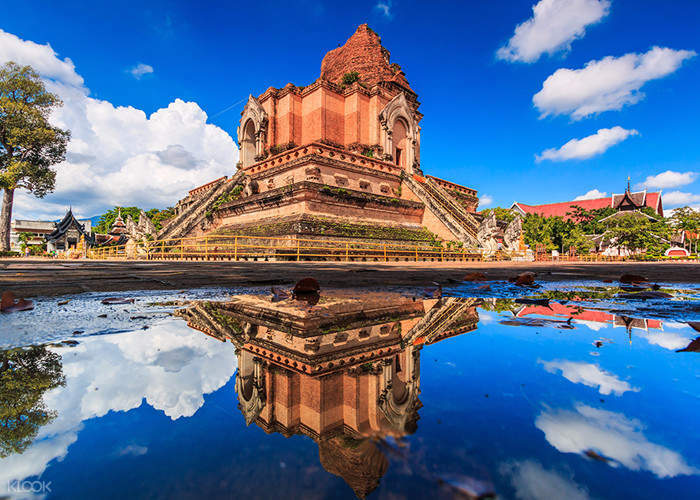 Enjoy a hearty buffet lunch at Holiday Garden Hotel, then you're off to your last stops - Wat Phra Singh, perhaps the second most revered temple in the area, and Wat Chedi Luang, home to the largest Buddhist pagoda. Hotel located in Chiang Mai South (Hang Daog) will incur an additional charge of THB700-THB2,000 depending on the distance (please see the map below). The tour was 100% worth it! Our tour guide was so knowledgeable about Thai history and would explain even the tiniest detail about a landmark. He was also very friendly, accommodating and his would joke around at times with his bubbly personality! As for the places that we went to, if you love looking at the architecture and intricate designs of temples then you would really enjoy the variety of temples that is in this tour! The time given for each location was sufficient and we had an ample amount of time to pay respect to the temples and take decent instagram worthy pictures!!! It’s definitely more convenient to book this tour as the places are quite far and Chiang Mai doesn’t really have any other form of convenient tour transportations except for a cab maybe. Definitely recommend if you want to experience and understand Chiang Mai history and origin in a day!!! The tour was 100% worth it! Our tour guide was so knowledgeable about Thai history and would explain even the tiniest detail about a landmark. He was also very friendly, accommodating and his would joke around at times with his bubbly personality! As for the places that we went to, if you love looking at the architecture and intricate designs of temples then you would really enjoy the variety of temples that is in this tour! The time given for each location was sufficient and we had an ample amount of time to pay respect to the temples and take decent instagram worthy pictures!!! 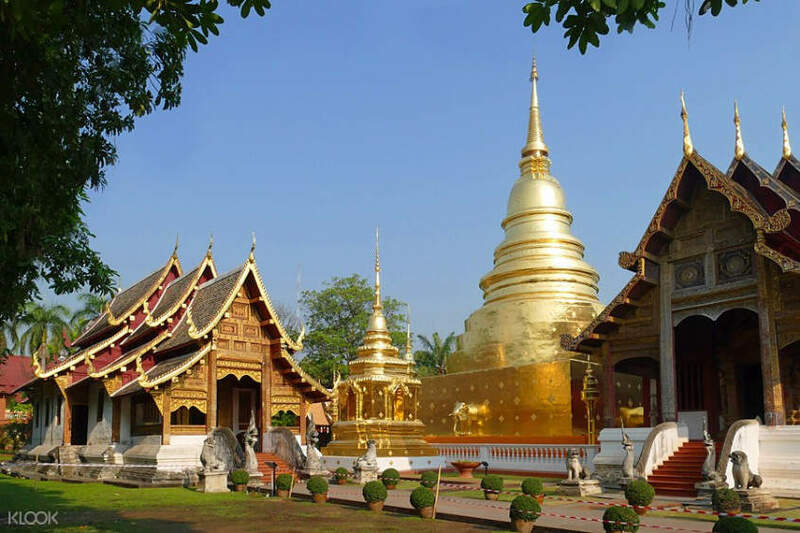 It’s definitely more convenient to book this tour as the places are quite far and Chiang Mai doesn’t really have any other form of convenient tour transportations except for a cab maybe. Definitely recommend if you want to experience and understand Chiang Mai history and origin in a day!!! the pickup at our place was very punctual and our guide is very knowledgeable! she shared on many small details which regular people wouldnt notice much. very friendly and professional! the pickup at our place was very punctual and our guide is very knowledgeable! she shared on many small details which regular people wouldnt notice much. very friendly and professional! Enjoyed the trip and it was fun learning about their history. Mr. A is an excellent guide. Enjoyed the trip and it was fun learning about their history. Mr. A is an excellent guide. Good program. Our guide Mr.M was friendly and knew much about places. Good program. Our guide Mr.M was friendly and knew much about places. we have a total of 11 pax on this trip, consists of one 80-year old grandmother, 3 teenagers and 7 adults. The view at the peak of the Doi Suthep pagoda was beautiful. You can have the picturesque 360 view of the surroundings. The tour at Bhubing Palace was only great because of the Rose garden, if you like flowers and roses. All kinds of colours you can find in this rose garden, pink, white, yellow, red. Other than that, many routes within the palace was not accessible (no entry sign). Do not expect much from the buffet lunch at Holiday Garden Hotel. It was edible, lots of carbo (noodles, rice, bread) with no special dishes. 2 more temples to go in the afternoon, one is the oldest and one is the tallest. we have a total of 11 pax on this trip, consists of one 80-year old grandmother, 3 teenagers and 7 adults. The view at the peak of the Doi Suthep pagoda was beautiful. You can have the picturesque 360 view of the surroundings. The tour at Bhubing Palace was only great because of the Rose garden, if you like flowers and roses. All kinds of colours you can find in this rose garden, pink, white, yellow, red. Other than that, many routes within the palace was not accessible (no entry sign). Do not expect much from the buffet lunch at Holiday Garden Hotel. It was edible, lots of carbo (noodles, rice, bread) with no special dishes. 2 more temples to go in the afternoon, one is the oldest and one is the tallest. My group And I would like to Thank our guide MAE For giving US enough Information regarding history And every details of temples she always make sure that we are enjoying our trip,buffet food is okey 👌The driver is kind And very much aware of our needs And drives smoothly Thank you 😊we really enjoyed our trip in Chiang Mai. My group And I would like to Thank our guide MAE For giving US enough Information regarding history And every details of temples she always make sure that we are enjoying our trip,buffet food is okey 👌The driver is kind And very much aware of our needs And drives smoothly Thank you 😊we really enjoyed our trip in Chiang Mai. It was a very good one day tour and the guide was very nice and experienced. It was a very good one day tour and the guide was very nice and experienced. Mr. M is super nice and he can speak fluent mandarin and english! he is very helpful and he introduces the temples history to us throughout the whole trip! Mr. M is super nice and he can speak fluent mandarin and english! he is very helpful and he introduces the temples history to us throughout the whole trip!